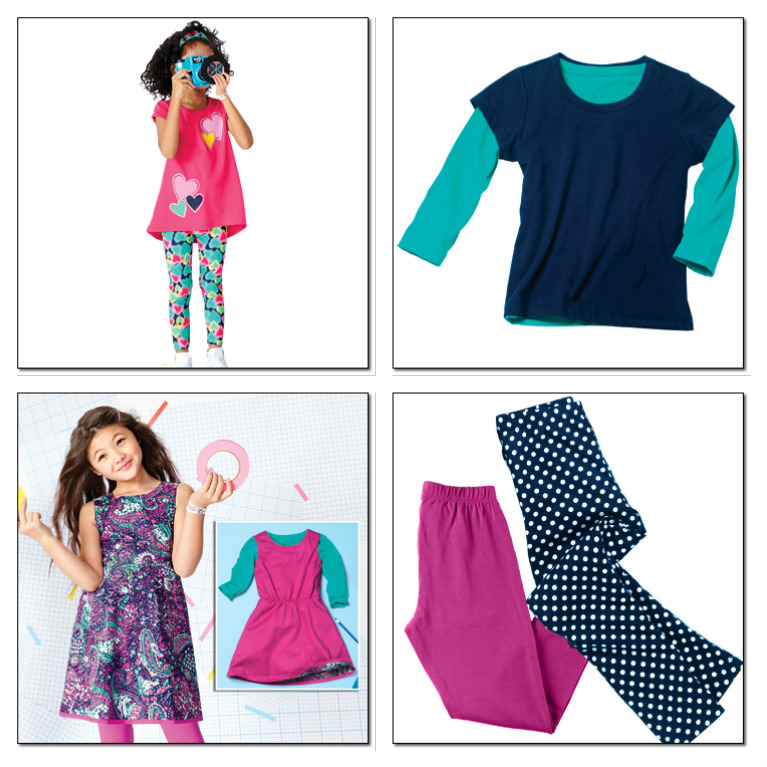 Mix it Up with these easy pieces and multiple ways to wear them and she'll be picture-perfect all week. Pick up these 4 sets for a total of 7 pieces that can be mixed and matched into all of these outfits and many more. 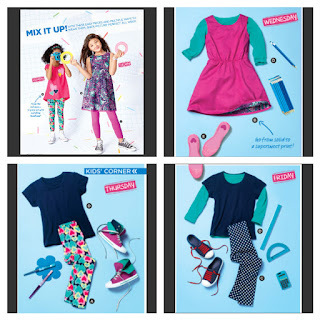 That's a whole wardrobe of about 20 different outfits for only $62.96. I seriously wish we sold these when my girls were young. It would have made back to school shopping so much easier. 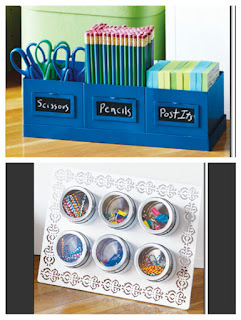 Whether you're planning the next PTA meeting or working form home, staying organized is a cinch! With our great selection of organizers you can make a neat work space for yourself or an organized homework station for the kids. 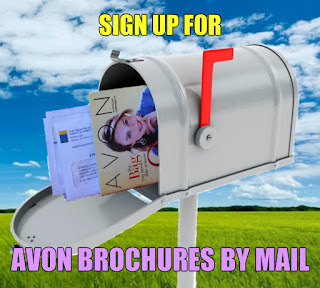 Stay up to date with everyone's comings and goings with one, or both of our wall organizers. 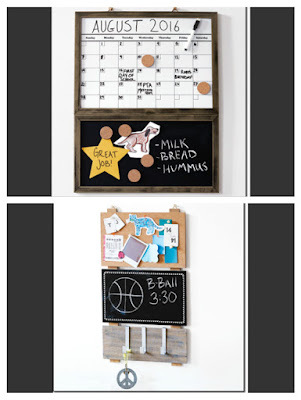 The Chalkboard Corkboard Message Board has a corkboard for pinning notes or pictures and a chalkboard for written notes. With the 3 metal hooks this board makes a great addition close to where your family comes and goes. Keep keys or lanyards handy along with a place to post notes for everyone to see. Keep all the small things right where you can find them in one of our multipurpose orgainizers. The Herb Pots and Tray Set consists of 1 tray, 3 pots and 3 sign boards to classify each container. Use to keep office or school supplies organized. The pots can be stacked in the tray to keep them all together or you can separate them and have 4 containers for all of your pens, pencils, crayons and other supplies. For even smaller supplies, there's the Magnetic Multipurpose Organizer. The set of 6 2.5" x 1.5" containers magnetically attach to the metal rack which can be set up on the table or hung on the wall. 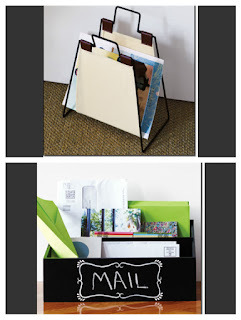 The Collapsible Canvas Magazine Holder is a stylish solution to storing magazines, catalogs or files on your desk or next to your favorite reading chair. The Chalkboard Front Desktop Organizer has a removable insert so you can have one large open box to lay papers or supplies in, or divide the box with the insert to keep your notepads, bills and mailing supplies standing up for easy access. The Travel Mug and Tumbler Set is perfect for drinks at home or on the go no matter what the weather. I got this set for myself and I like that they fit easily in the cup holders in my car and the 16oz size is a standard size for coffee shops so it's easy to reduce waste by using my own cup when I get drinks on the go. If you're a Starbucks fan, both the mug and the tumbler are grande size. 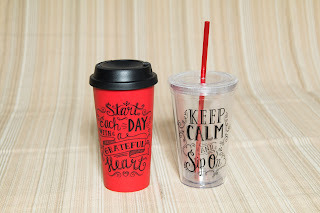 The travel mug reminds you to "Start each day with a grateful heart" and keeps your hot drinks handy. It's plastic so you don't have to worry about dropping and your drink will stay hotter longer than the standard to go coffee cup. I love ice cold water and tea, especially in the Las Vegas summer. The double walled tumbler keeps my drink cold much longer than the typical to go cup from a restaurant or convenience store. I often fill the cup with ice at the start of the day and carry a bottled water or two refill as the day goes on and I've still had ice in the cup after over 3 hours in my car, in the summer heat. And since staying hydrated is very important the tumbler sitting on my desk reminds me to "keep calm and sip on." My family loves popcorn. In fact we make it the old fashioned way on the stove. The Gourmet Collection Popcorn Bowls are the perfect way to enjoy that fresh popcorn or your favorite air popped or microwave version. 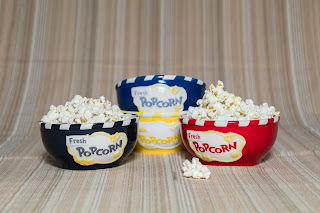 You can choose the Family Popcorn Bowl for everyone to share, or get the set of 4 for everyone to have their own supply of popcorn for family movie night. The ceramic bowls are dishwasher safe so clean up is a breeze.